Philip Parkin, the most noted resident of Thompson Township, is comfortably located on farm of about fifty acres on section 29, where he formerly owned a large farm; the part of which he sold, however, in 1882. His ancestors on both sides have been Englishand his grandfather, Joseph Parkin, was born in Devonshire, England; as was his fatherwhose name was John; and who with his wife, Margaret Pascoe, spent most of their in Cornwall, England. The father died at Helstone in 1864, at the age of seventy-years. The mother died in the year 1875, at the age of ninety years, and both are in one grave in the churchyard at Sythney. They were the parents of nine children, eldest being an infant who died before being named; Philip was the next born, then John, Lovina, William, Elizabeth, Joseph, and two infants who also died before being named. The subject of this sketch was born Oct. 20, 1817, in Cornwall, England, and was reared on his father's farm in that county. Shortly after becoming of age he decided to better his fortunes in the New World, and set sail for New York. From there he came West by way of Pittsburg, Cincinnati and St. Louis, and landed in Galena on Saturday morning, May 19, 1840; the only representative of the family who came here at that time. While yet a young man in his native county he had shown a great aptitude for mechanics, and his attention having been called to the necessity for improved fanning-mills, he invented and improved a machine that far excelled anything of the kind ever before used in England. These he began to manufacture in his native county, securing the use of a carpenter's shop and tools, and hiring the carpenter to work for him by the day. In this way he acquired a thorough knowledge of the carpenter's trade, at which he found employment on coming to Galena, and as early as 1843 did some work in Thompson Township. As soon as the land in this region was put on the market he purchased i20 acres from the Government, located in Mill Creek Township, now Thompson Township - being then called Mill Creek because of a number of sawmills on a creek of that name. 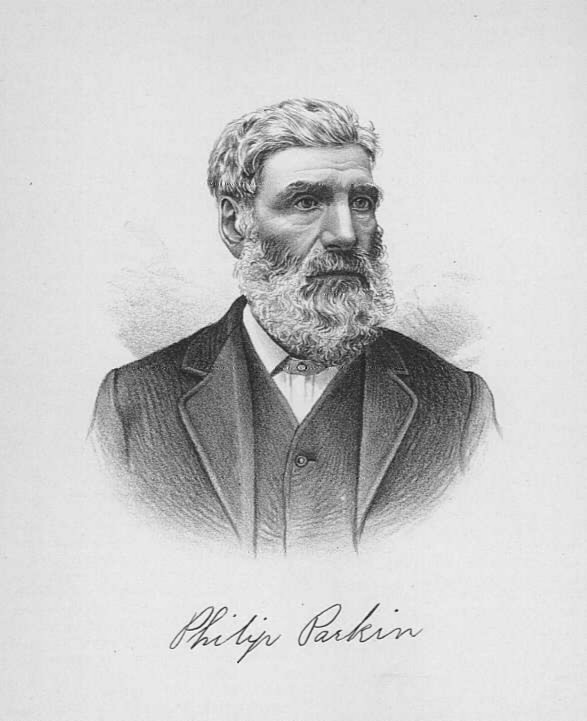 Mr. Parkin is one of the few pioneers still living on land bought directly from the Government; and long before the "Iron Horse" had made his way across the broad prairies, he had maintained himself comfortably in this then comparatively wild country; and by his industry and thrift, backed by rare good judgment, laid broad and deep the foundation upon which he has since built so noble a superstructure of prosperity. Like the hardy oak, tried by the storms of time, he towers among his fellow-men. At his trade of carpenter Mr. Parkin was expert and successful, and many of the best dwellings in Jo Daviess County bear testimony to his proficiency in the use of the tools of the craft. As a farmer he has also been very prosperous, and from his broad acres has won a golden tribute. Nor has his usefulness stopped here; he has been a leader in the promotion of enterprises of almost every kind tending to the prosperity of the county. He was the prime mover in establishing the Farmer's Mutual Fire and Lightning Insurance Company, of Guilford and Thompson Townships. To that corporation he has given more time than any other man in the county. From the beginning he risked his money many times in order that the company should prosper. The subject of mutual insurance was not at that time generally understood either by himself or his neighbors, but knowing that the principle was right he concentrated his thoughts and energies on the subject, and has given to the farmers of Guilford and Thompson Townships a system of mutual insurance satisfactory in the highest degree to all concerned, and the company is now on a substantial financial basis - never standing as solid as it does to-day. It is said by many of his neighbors that but for the material assistance rendered to the company in its infancy by Mr. Parkin it would never have survived. The company was incorporated under the laws of the State of Illinois, May 5, 1877, and Mr. Parkin was elected its first president. Mr. Parkin has been twice married, his first wife being Miss Margaret Wakefield, who died leaving no issue. To his present estimable wife he was united in 1884. She was Mrs. Elizabeth Newsom, daughter of John and Clarissa (Rogers) Evans. Her father being a native of Wales, where his father had been a farmer. Grandfather Rodgers was a sea-captain, and an uncle Rodgers was captain in a line of ferry-boats plying between Liverpool and Woodside, England. The parents of Mrs. Parkin had nine children, namely: Mary, John, Samuel, Thomas, William, Martha, Harriet, Alice, and Elizabeth. The mother of Mrs. Parkin died when the latter was but ten years old, and the father followed his wife to the grave three years latter. Thus left an orphan at a tender age, she has but a faint recollection of her parents. She was brought up under the roof of her sister, Mrs. Mary Lumley, with whom she emigrated to America. They settled in Galena in 1849, at which time Elizabeth was fifteen years old; and two years later, at the age of seventeen, she was married to Mr. John Newsom. By. this union she became the mother of five children, four of whom lived to maturity: Clara is the wife of William Simmons, a resident of Galena, and the mother of three children - Bessie, Estella, and Lillie; Lillie is deceased, and Maud and Mattie are living with their mother. In the public affairs of his township Mr. Parkin has borne a very prominent part. He was elected its first Highway Commissioner, and has served as President of the Board of Highway Commissioners for several years. Later for six years he served his fellow-citizens as Supervisor for the town. The history of his life is indeed closely interwoven with that of his township. From its organization to the present time he has repeatedly been the recipient of the highest honors that could be awarded by his townsmen. In addition to the positions named he has been for more than a quarter of a century Justice of the Peace, and an ex-judge of Jo Dayiess County has given it as his opinion that no justice in thc county has ever taken more pains with his official duties than has Squire Parkin. He is well versed in points of common law, and has high sence (sic) of justice and equity. A leading lawyer of the county says of him that he is extremely accurate in all his transactions, and to-day wields a greater influence among people of all classes than any other man in Thompson Township. In his official capacity he has married the young and drafted the wills of the old; he has surveyed the lands and drawn the deeds of the living, and has administered on the estates of the dead. In brief it may be said of him that he has been the central figure around which the affairs of the town revolve. Every duty he has been called upon to perform he has executed with painstaking fidelity, and honesty, and few of the decisions rendered by him as magistrate have ever been appealed. In politics he is a stanch Republican. The wedded life of our subject and his wife is an happy one. They are situated in a comfortable home, in a dwelling built by the hands of the father in his younger days, and the timbers of which he cut and hewed in his own woods. His house is the most elegantly furnished in the town, and Mr. Parkin freely spends the means accumulated by a lifetime of toil and frugality in beautifying his home, and in gratifying the tastes of his wife and family. His affectionate and devoted wife is a true helpmate in every sense of the word. Her strong will is controlled by good judgment and a womanly heart. She is a woman of uncommon native force of intellect; but assuming the duties of a wife while yet only a girl she was compelled to devote her energies to the stern realities of life. Her noble work as a widowed mother, in rearing and educating her children, is deserving of especial honor. Mr. and Mrs. Parkin are both members of the Methodist Episcopal Church at Salem, of which he is Steward as well as Trustee. Mrs. Parkin's membership in the church dates back to her seventeenth year. Among the portraits of prominent citizens presented in this Album may be found that of Mr. Parkin.